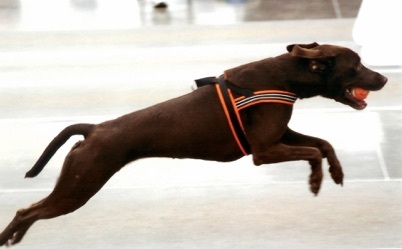 Brandy is a reddish brown bundle of energy of mysterious canine lineage who loves to run, but not always in the direction preferred by her handlers. Born in December 2005, she was adopted in October 2006 from the SPCA in Baltimore, MD, and now resides in the Moran household in Ellicott City with three companions--two human and one feline. 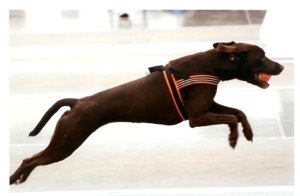 While training and competing in agility, she demonstrated a fondness for “the zoomies” (i.e., randomly accelerating with little or no regard to instructions from her handler). Occasionally, she will “zoom” in the house, rearranging the furniture and rugs in the process. 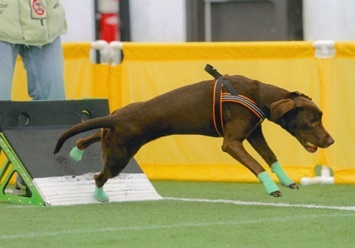 Amused observers of her antics suggested to her human companions that flyball would be an appropriate outlet for those tendencies. 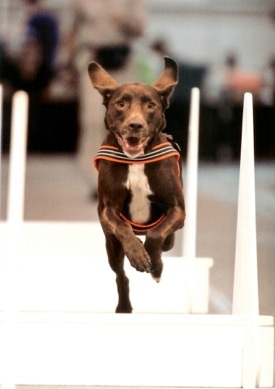 Brandy’s flyball debut occurred in March 2011 at the March Madness tournament when she ran one heat of the last race for her team. 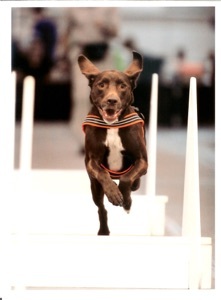 Since then, she earned her Flyball Dog and Flyball Dog Excellent titles at the Flash Point tournament in July 2011. Brandy has now retired from flyball.